Concrete Balcony Repair | Adriatic Restoration Corp.
Balcony repairs often begin by evaluating the repairs necessary for the concrete. Cracks in the concrete, even hairline cracks, of a balcony will prove to be problematic in the elements of the northeast. Adriatic’s first steps will be to investigative the causes of the deterioration to determine underlying conditions. Once the causes are determined, Adriatic’s professionals will repair the concrete balcony and any accompanying balcony railings. 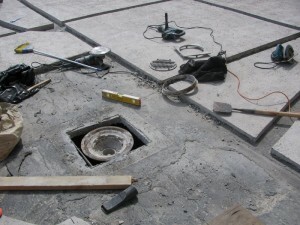 The keys to concrete repair or balcony replacement include removing all deteriorated concrete and steel, exposing corroded re-enforcing steel, surface prep of remaining exposed steel and concrete, and the application of an appropriate patching material with similar properties to the original concrete. The proper treatment of steel and concrete will ensure the longevity of your balcony restoration.